Valdosta Utilities Director Henry Hicks gave a detailed history of flood control projects and work on the Withlacoochee Waste Water Processing Plant at the Valdosta City Council Meeting last night during the "Manager's Report" section of the agenda. Several Council members expressed their distaste for the VDT's recent reporting on the subject, and thanked Hicks and other city employees for their work. Hicks said they had spent $4 million on repairs to the Withlacoochee plant, and that didn't include the $40 million they'd already spent on upgrades in general. Also, it took three days to build the berm around the plant in 2009, and FEMA wouldn't approve any improvements to it. As he indicated yesterday, Gabe Fisher got his sewage-covered neighborhood on WCTV last night. After days of torrential rain, the same rain that caused the rivers to flood, the sewage pump has been overwhelmed in the Meadow Brook Subdivison just off Gornto Road. "You know how bad it smells in a bathroom when someone goes in and uses a public restroom. Multiple that ten times," said Chad Harrison, a local resident. The whole area behind their houses is just covered in raw sewage. Your boots sink down into it with every step. We're talking everything from human waste, to toilet paper, to hygiene products and a whole other list of things that are just too graphic to mention. "Probably about 12 to 14 inches of raw sewage," said Harrison. "It's just everywhere. It's all up and down the creek. It's all behind everybody's houses." At approximately 1:30 p.m. today, March 3, the Withlacoochee Wastewater Treatment Plant was brought online and returned to normal operation, after a loss of function for only three days compared to the nine days of complete loss of function experienced in the flood of 2009. Today, the river receded to the point where the temporary by-pass pumps could be connected to the existing valves. The system was turned on, became fully operational and began full treatment capabilities. The installation of bypass pumps, pipes and valves to utilize in the event of an emergency or act of God. In 2009, the berm only protected the pump station, which did not prevent flooding of the chemical building, the chlorine contact building, the filters and the belt presses. The plant's electrical system was destroyed in the flooded area and the filters and belt presses were inoperable. In this event, the electric system, chlorine cylinders, de-chlorination system and all flooded areas were turned off to avoid the damage that was experienced in 2009. In this event, the biological, natural occurring bacteria that are used in the treatment process were saved so that the system could treat wastewater immediately when it was turned back on. In 2009, the natural occurring bacteria were washed out of the plant as a result of the continuous pumping during the event. In this event, the plant was fully operational in three days. In 2009, the plant had a complete loss of function for nine days and was not fully operational for over a month. I know you are frustrated and pissed. My hope was with the info below all could see the city has not just been idly sitting by. What has been so frustrating for us is that our biggest problem is outside of the city limits. As discussed below, we are about 90% complete on the design for the big force main project. Once completed it will eliminate the sewage spills during high rain events in your neighborhood. Just spoke with Larry Hanson and the WWTP is firing back up as we speak. Soon you should start seeing the current spills end as the system is brought fully back up and running. Something I might add we could not have done so quickly had we not taken the steps we did these past several days. Received today in response to Tim Carroll's email. All, Gabe Fisher here—2420 Meadow Brook. I do not currently have the time, nor mental capacity to fully think through this issue, but I want you all to see what the sewer system is currently doing to our backyards. This video was taken today, in by backyard, after the flood. It has been spilling at least at this same rate for the last 7 days. Video by Gabe Fisher, Valdosta, Lowndes County, Georgia, 3 March 2013. This contaminated water breached my crawlspace, around 24" deep, and must absolutely be dealt with ASAP. What is the city going to do for me, and my neighbors who are in this same situation?? There is no other word for it—I am pissed. I have seen zero results since the flood in 2009. Yes, maybe receiving 12" inches of rain is an act of God, but that does not account for all the man made structures that force the flood waters higher at my location, nor other obstacles it must overcome to quickly and efficiently escape our area—such as the train trestle along Gornto. And it absolutely does not account for the city's poorly planned sewer system.. This isn't the first sewage spill since the flood of 2009—there have been countless others in my area. I have photos and video evidence of at least 5 that would likely be classified as 'major'. This cannot and will not be 'swept under the rug'.. I am still currently upside down on my property due to the flood of 2009 and this current flood has only further degraded my property's value. The VDT has apparently decided the City of Valdosta is to blame for the Withlacoochee Wastewater Woes, and has made its case in a story and two editorials. They seem to have forgotten about the overflow in 2012 already. And the VDT seems to have forgotten about it and its editor's own apparent roles in the loss of the recent SPLOST election that would have funded a new wastewater plant. When the flooding occurred in April 2009, the City made extraordinary efforts to hold back the flooding, bringing in dirt and heavy machinery to build a berm around the influent pump station and other treatment equipment, working round the clock. The efforts were successful. The treatment plant remained on during the duration of the flood, and Valdosta's raw sewage remained contained, though the facility incurred damages to its electrical and biological purification systems, according to Utilities Director Henry Hicks. This year, the City opted for a different approach—cut electricity to the underwater portions of the plant, submit to the flooding and clean up afterwards. The plant was “taken offline” Thursday at 9 a.m. “to prevent further damage to equipment and associated electrical and control systems,” according to a statement issued by the Department of the City Manager. The City stated that as a result of the shutdown, “untreated sewage will be discharging directly into the river” at a rate of between five and six million gallons of raw sewage per day. In addition, the floodwaters were allowed into the plant and around the remaining portions of the berm that was constructed in 2009 during the rising flood. Only half of the berm now remains, as the other half was removed to allow access to the lower portions of the plant, Hicks said. So far, this year's response strategy seems to have saved the City money. In 2009, about $500,000 was spent in manpower, equipment and supplies to build the berm alone, and the plant, kept running, incurred significant damages though raw sewage was kept out of the river. This year, the money was not spent on the berm or to prevent the flooding, and at least 15 to 20 million gallons of raw sewage will have been released into the Withlacoochee by the time the plant is back online. Editor Kay Harris contributed to this story. Here are pictures and videos of the Withlacoochee River at GA 122 on 18 February 2013 (on the left when the river was rising) and 27 February 2013 (on the right, when it was clearly in flood stage). Pictures and videos of the Withlacoochee River at GA 122 by John S. Quarterman and Gretchen Quarterman for WWALS Watershed Coailition. And the Valdosta Daily Times has discovered video! 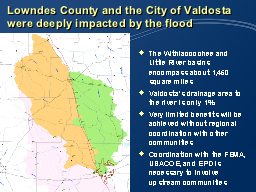 VDT posted 25 February 2013, The effects of rain, which includes video of numerous locations around Lowndes County. This is all relevant to the Withlacoochee Wastewater Woes for Valdosta and Lowndes County. AP picked up the story about flooding at Valdosta's Withlacoochee wasterwater treatment plant, citing the VDT and the City as sources. The City of Valdosta thinks the County should contribute to replacing the plant, or maybe the legislature will authorize a municipal option sales tax (MOST). Authorities shut down a south Georgia wastewater treatment plant as a river flooded critical buildings and structures. Valdosta city officials said power at the plant was shut down Thursday to prevent further damage to equipment and control systems. The city estimates an average of 5 million to 6 million gallons of untreated sewage will discharge daily into the Withlacoochee River until the flood waters recede and the plant can resume operation. The AP story continues, but let's cut to the sources.